Because of its rich history, Odisha is a popular tourist destination now. Many of the historical sites in the state date back to the Stone Age. In the ancient times, the state of Odisha was known as Kalinga, and is often mentioned in Hindu epics. Its territory formed a part of the ancient kingdom of Kalinga of Mahabharat fame. According to the legend, Kalinga, one of the five sons of a sage, travelled as far as the hills of the Eastern Ghats. While looking down at the valleys below, he was fascinated and decided to settle down here with his people. Since then, Odisha was known as Kalinga. Odisha’s recorded history begins from 260 B.C. Emperor Ashoka installed carved Rock Pillar at Dhuli, only 5 km. from the present capital of Bhubaneshwar. The pillar has stood for almost 23 centuries. The carved inscriptions carry the message of Buddhist principles. Ashoka, the Mauryan king of Magadh, invaded kalinga in 261 BC and this event has gone down history as the Kalinga war, causing a greater change in the heart of the emperor than in his empire. This was last war fought by him after which he became a great champion of Buddhism and upheld the values of peace and non-violence. The zenith of Odisha civilization reached between the 4th and 13th century under the great builders – Kesari and Gang kings. During their rule, thousands of temples and monuments were built all over the country. The Kalinga school of architecture flourished from the 7th to the 13th century A.D. The most important monuments of this period can be seen in and around Bhubaneswar and Puri.The Lingaraj Temple in Bhubaneswar,the Jagannath Temple in Puri and the Sun Temple Konark are some of the finest temples of this period. The state remained outside the power of Muslim invaders till late 16th century. When the Muslims invaders reached Odisha they destroyed about 7,000 temples that once lined the banks of the sacred lake of Bhubaneshwar. Of these, only 500 temples remain now. In 1803, the British took over Odisha. Since Odisha was not strategically important for them, very little was done to improve its economic conditions. 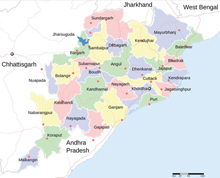 After India's independence, the state was amalgamated into a compact province of Odisha.